Are you tired of having to police your kids’ dental care? Tired of feeling like the bad guy, every single time you have to remind them to brush their teeth, or stand over them as they do so. If so, take a tip from your family’s preventive dentist, and find ways to make oral care more fun for the whole family. That way, you can help protect your kids teeth and gums, without wasting times feeling like the family’s smile sheriff! Make Brushing and Flossing More Fun – Really! 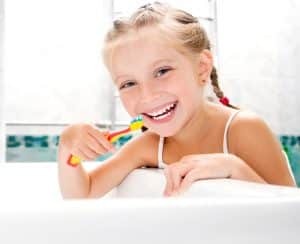 If you, yourself, dread dental hygiene you may find it hard to believe that it’s possible to get kids excited about their oral care routines. That said, there actually are ways to make the process more pleasant for everyone involved, including you, as the parent. For instance, right now, do you simply buy your kids whatever toothbrushes are closest to the checkout, or on sale, at your pharmacy or grocery store? If so, simply switching up the system, to allow them to pick out their own toothbrushes, can help them feel more in charge of their own dental health, and therefore might help to inspire an increased sense of responsibility, and confidence! You could also surprise them, once a month, with a new toothbrush that features each child’s favorite superhero, cartoon character, or some other design that will elicit delight! Another simple and pediatric dentist-approved trick for getting kids interested in their dental care, is by choosing toothpastes specifically designed for kids, namely ones with popular flavors, like bubblegum, berry, or even bacon! The key to choosing a paste, and floss, that is going to be a big hit with your kids, and safe and effective, is simply looking for those packages that bear the American Dental Association’s seal of approval. You will also want to make sure you’re choosing a product that is age appropriate, and you should teach your kids how to use the appropriate amount of paste and floss, as well.